In solidarity, the Congregation of the Dominican Sisters ~ Grand Rapids of Michigan blesses Joan Williams, OP on her Pilgrimage to Honduras March 18-25. The interfaith delegation hosted by the Salvadoran Humanitarian Aid, Research and Education Foundation (SHARE) will study justice issues and root causes of migration and extend messages of international solidarity through accompaniment. In March, the Dominican Sisters ~ Grand Rapids are working to raise awareness about Central America, specifically Honduras and El Salvador. 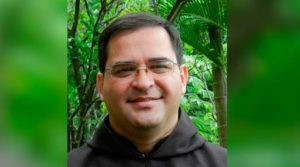 This month, Dominican Center at Marywood in Grand Rapids, Michigan prepares to welcome Bishop Oswald Escobar Aguilar, OCD from El Salvador to West Michigan. At the same time, Sister Joan, a Grand Rapids Dominican Sister, is leaving for the Interfaith Root Causes Pilgrimage to Honduras. Both actions are timed during the 39th anniversary of the martyrdom of Saint Oscar Romero to raise awareness about violence, repression, and economic instability in Central America. Knowing of the struggles of the people of Central America, we want people in West Michigan to understand who Saint Oscar Romero was and how his legacy continues to be relevant in our world today, especially in relation to migration and immigration. 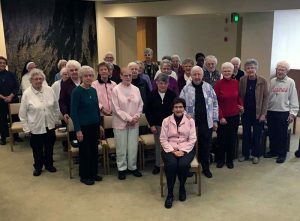 In solidarity, the Congregation of the Dominican Sisters ~ Grand Rapids of Michigan blesses Joan Williams, OP on her Pilgrimage to Honduras March 14-25. The interfaith delegation hosted by the Salvadoran Humanitarian Aid, Research and Education Foundation (SHARE) will study justice issues and root causes of migration and extend messages of international solidarity through accompaniment. Members of the delegation will shine a light on the factors that compel individuals to leave their homes in desperate search for protection and survival across borders. During the week, participants will also reflect on St. Romero’s message and its context in Honduras today. This focus on the people of Central America isn’t new to the Dominican Sisters ~ Grand Rapids. Sister Joan lived and served in San Pedro Sula for 19 years before returning to the United States two years ago this month. She provided theological pastoral formation, accompanied men and women in prison, and provided HIV education and support to multiple families who had children HIV+. “I have witnessed the horrific violence, repression, and economic instability that force people to flee their homes and face the unknowns of migration across borders around the world. We cannot turn our backs,” she says.